Finishing in 1st place and winner of the Rod Bender Bait award. Rob and Jim spent a couple days practicing to find fish even fishing the Saturday before in the rain. The two anglers did not get chance to spend time prefishing. Charlie said he did spend Memorial Weekend with a friend that has a cottage on the lake and spent a little time fun fishing but rather they relied on past tournament experience of the lake and fishing those spots to find their fish. They had two lures that produced for them on Saturday, a Senko in 3 – 6’ of water and a Erie Darter in 12’ of water. ​​Earl and Charles brought 10.07 lb. to the scales earning them $446 in cash. ​Once again we find the team of Fletcher and Mangus on the podium at Randal. Their 2013 finish of 18.88 Lb. 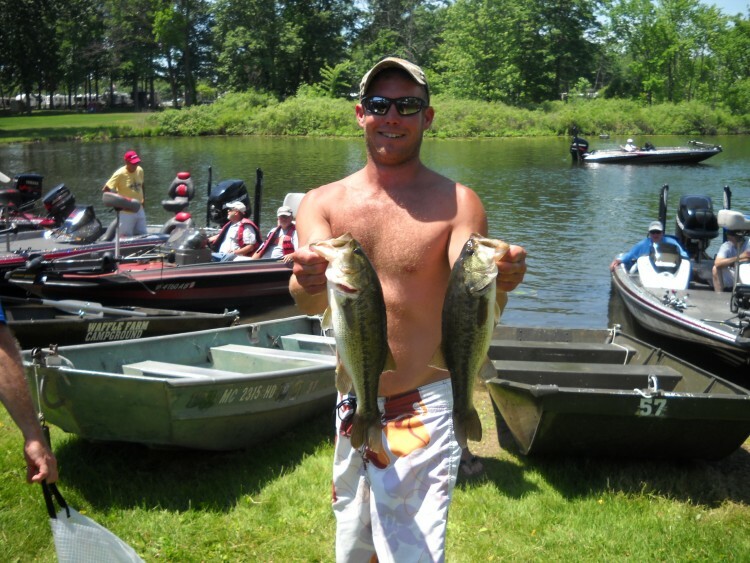 is legendary among these parts, backed up by their 2nd Big Bass and 9 place finish in 2014. Having skipped the Randal Chain in 2015, 2016 once again finds this team near the top at the Randal event. Bear and Mike brought 8.20 lb. in netting them a check for $194. ​​Zach and Cole placed 7th with 7.44 pounds with a big bass of 2.29 pounds. ​​The team weighed in with 2 fish and 3.02 Lb. 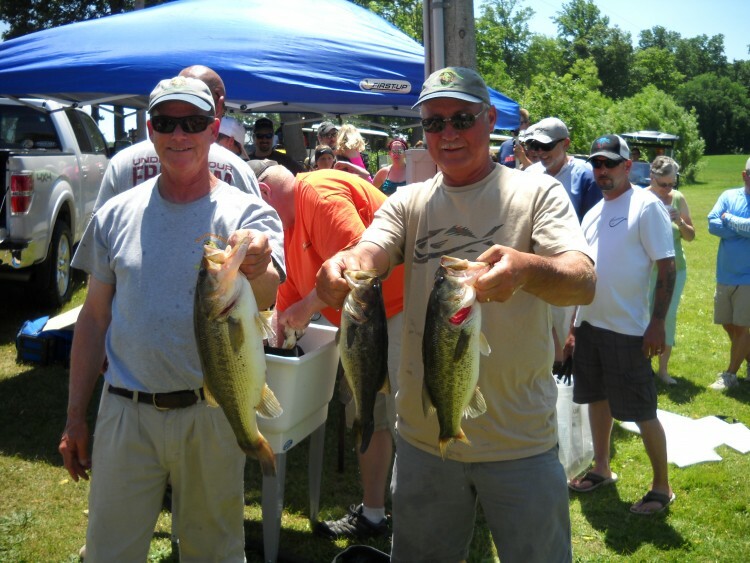 The R & B Bass Circuit Eastern Division launched at Craig Lake on the Randal Lake chain on June 11th. Several teams opted out of the tournament be we launched 32 boats. Although warm, the weather couldn't have been better, the fishing could have but the weather was OK.
​It took 12.33 Lb. 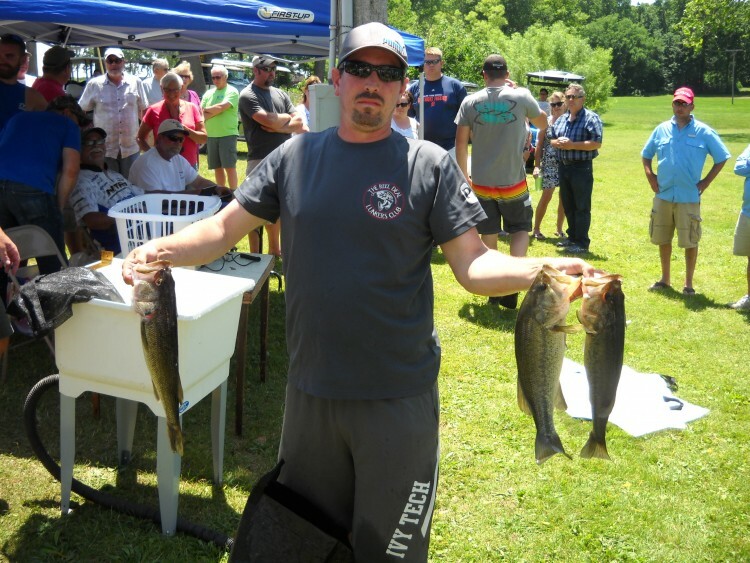 to win, and participants weighed in 59 bass and 113.70 pounds of fish to a crowds of spectators from the Waffle Farm Campground. Ever the sportsman, we want to that the team of Keith and Johnathan Schroder. Seeing so many of us struggle today I guess they felt bad. So making a sacrifice to the fishing gods Johnathan was seen putting their potential Big Bass back in the lake prior to weigh in. I recon that should improve all of our luck at next months St. Clair tournament. On be half of all of us, Thanks. 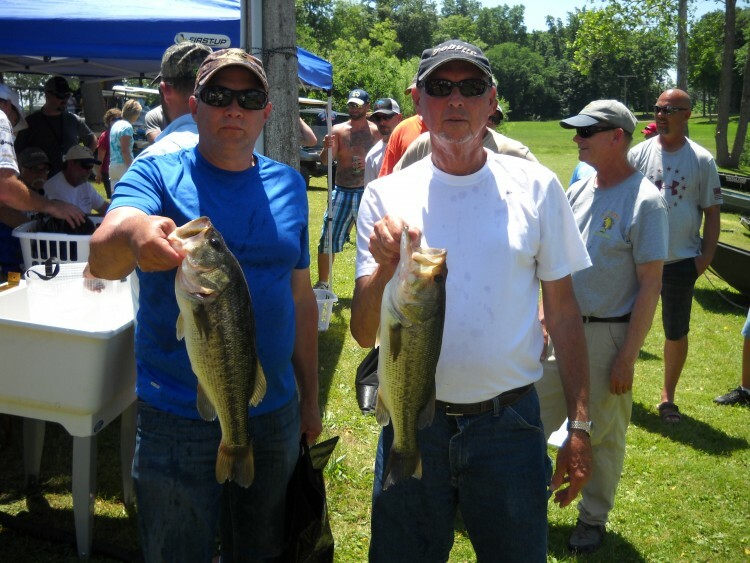 Bob and Jim brought 12.33lb. to the scales with a 3.51 lb. earning $713 in cash. Greg said that their fist keeper fish came in perhaps as little as 6” of water fishing a centipede. The second also came shallow in a couple of feet on a Senko. Returning to the jig. their third and last keeper came out of 12’ of water. ​​Keeping a close eye on the lake, Greg made the prediction at Lake James that locating and catching tournament quality fish was going to be a struggle and that the total catch rate of the lake would be down this year. Following the tournament Greg said he was encouraged by the numbers of 2 lb. plus bass that were brought in. ​​Greg and Kevin brought 8.57lb. to the scales earning them $267 in cash.